This daytrip - by car - has it all: the dreaming Spires of Oxford, Gothic architecture of Salisbury Cathedral, Stonehenge: too well known for its own good, the largest stone circle in the world at Avebury (one of our favourites), unspoilt countryside, thatched cottages, beautiful villages,ancient Iron age burial mounds and a mysterious white horse carved into a hill 3000 years ago. We start by taking the M40 out of London - it comes in virtually to the centre - straight out to Oxford - just under an hour. The M40 in the west of London is very very busy during rush hours - and on a Friday that begins at noon. Look out for the 1940s Hoover building on your right as you course through the outer suburbs. From where the motorway cuts down through the chalk cliffs onto the Oxford Plain the scenery starts to get better. Oxford is well signposted and there's plenty of parking in the town centre - at a unitary price of £1.50. If you don't want to pay that there's usually 2 hour parking to the left of you as you come down the hill from Headington into Oxford proper, between the Cowley and Iffley roads. As you go through Headington - a village suburb of Oxford, look out on your left for the old High Street. A large shark seems to have crashed through the roof of a house - this creative loft addition was opposed by the council until art lovers united to make it a monument. 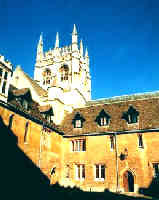 Spend 2 hours in Oxford: Christchurch, the college started by Cardinal Wolsey of Hampton Court fame - before Henry VIII decided to kill him - it would have been called Cardinal College and have had the largest cloisters in the World - sadly only the pediments were completed before Wolsey's pediment was severed from his fundament. 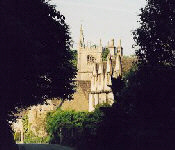 Magdalen has a stunning deer park, beautiful cloisters and a superb altarpiece in the chapel. New College is only new in relative terms - ie: newer than Merton (built 1264), the Old Library at Merton is the oldest in the world, with much of the book collection still chained up in chests, and the timbers coming from the Spanish Armada, as legend goes. Merton's chapel (1287) was planned to be much larger, only Walter de Merton ran out of money and it's in a T shape rather than a cross. However the shape became a fashion and now all college chapels are built like that. Some of the colleges charge admission - if money's tight one college should do - either Christchurch or Magdalen. The rest of the colleges can be seen by peering in through the gatehouses: Brasenose, Lincoln, Corpus Christi, University, Johns, and All Souls are on the main circuit. Also walk up Turl Street, Broad Street, High Street and through the Bodlean library's centre court. The Covered Market, off High Street is not what it was (it was famous for its game butchers, with huge haunches of venison, and all manner of small game hung outside their shops - but council regulations, BSE and foot and mouth have put paid to that). Have coffee there and if the weather's fine, buy provisions for a picnic lunch on White Horse Hill (vide infra). Next, you have a choice - North to Woodstock Village for a detour round Blenheim Palace - Churchill's old haunt and a magnificent pile with amazing grounds - it's £3 to enter the grounds, and another £6 to see the house. Worth visiting the herb garden and butterfly house - both free. If you're an archaeology fan, 10 miles further north on the Chipping Norton road are the Rollright stones which are a small set of standing stones - only for archaeology fans really - clearly signposted from the road. 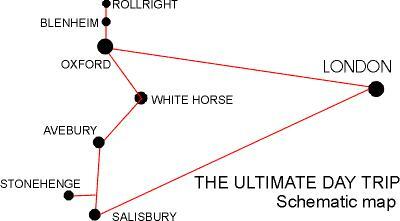 However if you leave Oxford towards Swindon you go down the Vale of The White Horse . Worth going up to the top of the hill as the views are superb, though the horse itself is best viewed from further off. Close by is Waylands Smithy standing stones - the legend says that a horse tethered to them overnight will be shod by the ghostly smith. We think it really is worth wandering about on these ancient hills - they still hold druidical ceremonies on Dragon Hill, a man-made edifice just below the white horse. According to legend (certainly not fact) it's the site where St George killed the dragon. Allow about an hour at the site: it's ideal for a picnic if you've bought supplies at Oxford's covered market. 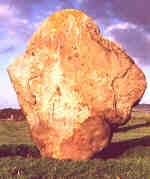 From the vale of the white horse we proceed to one of England's most impressive sites: Avebury. It's the world's largest stone circle - so large there's a village within it, with a picturesque pub church and manor house - an icon of rural life. Make sure you walk round the dyke that surrounds the stones as the best views are to be had from up there. There's free and open access to the stones - which is a major draw, considering the fencing-off of Stonehenge. A mile or so west is Silbury Hill the largest man made hill - beginning to subside so you can't climb it - it's right alongside the road so there's no real need to stop. What's worth the walk is West Kennett barrow - on the other side of the road - a well-preserved long barrow pre-historic burial chamber that you can actually go into - about 10 minutes walk from the parking place. From these two sites we follow the A345 south as it winds through a succession of beautiful towns and villages, full of thatched cottages to die for among them Upavon, Pewsey, Marlborough and Devizes (just off route but famed for it's canal with 29 locks, the second longest flight in the country rising 239 feet over a distance of 2.5 miles). The best villages nestle just off the main road - north of Amesbury - look out for interesting church spires and visit one at random. Southwest of Andover on the A303 is Stonehenge , perhaps the world's most famous stone age monument. It's unfortunately situated at the junction of two busy roads and you can't really access the stones themselves. We don't really think it's worth that much of a visit - the site has been spoiled, you can see the entire thing very well from the roadside. It used to be that you could explore the whole site, but a police drive against hippy travellers resulted in its being fenced off. From Stonehenge proceed south to Salisbury to visit the Cathedral (built 1220) has the tallest spire in the country and houses one of the 4 surviving copies of the Magna Carta - England's 'constitution' and bill of rights - signed by King John (although it isn't even mentioned in Shakespeare's play of the same name). If the scaffolding is still up for the restoration work there's a tour of it, enabling you unique views of the gargoyles. The guides get consistently good reviews. Lots of pleasant old buildings round Cathedral close. That's it, all that remains is to head back for London....if, however you want to spread the trip over into two we recommend staying at the Old Red Lion in Salisbury (now part of the Best Western Group)- about £84 a double room, some of them 600 years old - or at the White Hart which is much cheaper and has a good, moderately priced restaurant. STAY OVERNIGHT: If you're after a two-day trip see also our trips page. But if you want to do this trip more slowly - and Wiltshire has amazingly beautiful countryside - the downs are fantastic and there are lots of minor architectural and historical sights worth visiting (including some smaller white horses) then stay at a local pub or B and B we can recommend The Royal Oak, Wootton Rivers - which is not far from Marlborough - a small village miles from anywhere down single track lanes, but next to the canal. It has a single pub The Royal Oak which does accommodation and food. The rural life of the village has been spoiled by rising property prices and most of the houses are occupied by weekenders from London - which accounts for its pristine condition - and lack of general amenities/rural folk. From London follow Marylebone Road (past Madame Tussauds) onto the flyover A40, M40 - clearly signposted Oxford. From Oxford take the A34 towards Abingdon, past Abingdon turn off right on A415 to Marcham to join the A420 at Kingston Bagpuize, turn left to Pusey & Hatford on the B4508 At Fernham, turn left to Uffingham, follow signs to White Horse. From White Horse Hill take the B4507 to Ashbury, follow signs to Swindon, preferably via Idstone, Hinton Parva and Wanborough. At Swindon suburbs take the A4361 through Wroughton to Avebury village. From Avebury cut across on the B4003 to West Kennett, turn right on the A4 towards Beckhampton Sillbury Hill is fairly evident on the left of the road, West Kennett barrow is on the right. Go back on yourself on the A4 into Marlborough then take the A345 through Pewsey, Upavon to Amesbury (look out for cute villages on the left side of road between Upavon and Amesbury) turn right onto A303 Stonehenge is at the fork of the A303 and the A344. From Stonehenge continue on the A303 and turn left onto the A360 to Salisbury.